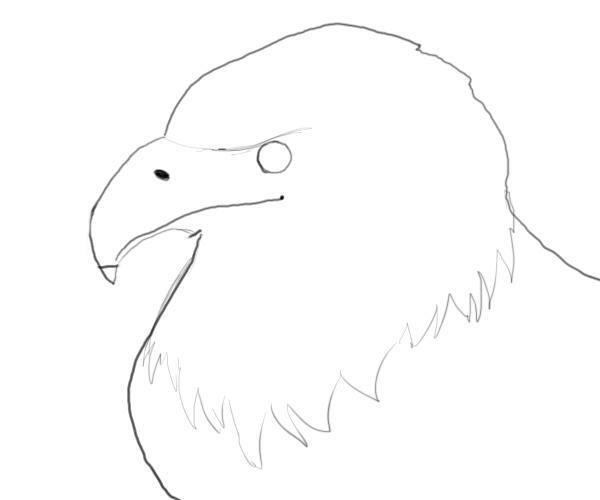 Learn how to draw a bald eagle with this stunningly easy step by step tutorial! 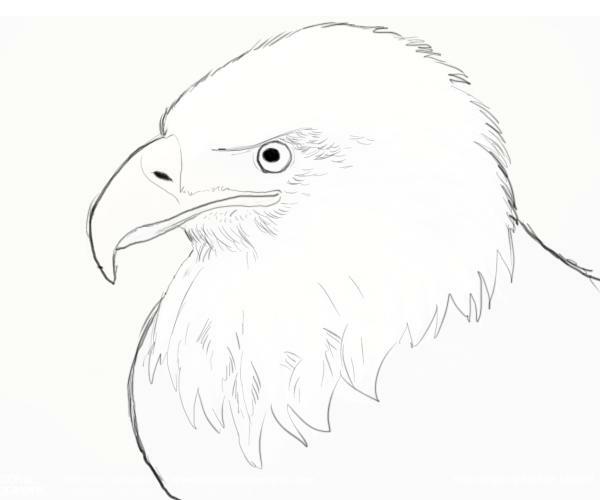 Bald Eagle Drawings – Welcome to this new tutorial by the Drawing Factory where you will learn how to draw a bald eagle. The Bald Eagle is a bird of prey found in North America. 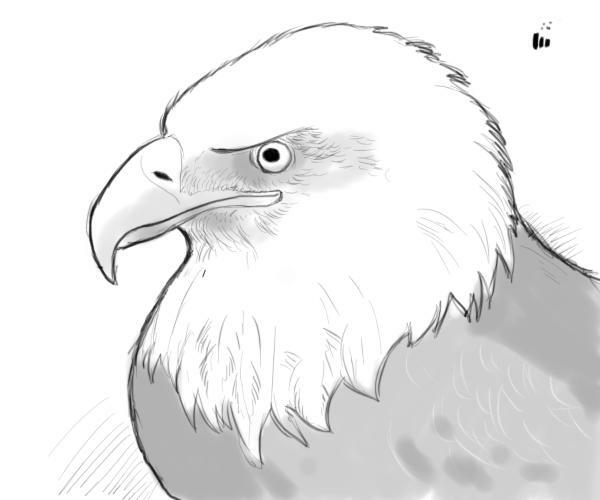 It is the national bird and symbol of the United States of America. Its range includes most of Canada and Alaska, all of the contiguous United States, and northern Mexico. It is found near large bodies of open water with an abundant food supply and old-growth trees for nesting. The Bald Eagle is a large bird, with a wingspan of up to 2.44 m (96 in), and a mass of 2.5–7 kilograms; females are about 25 percent larger than males. The adult Bald Eagle has a brown body with a white head and tail, bright yellow irises, and golden taloned feet and hooked beak. Now that you know a little bit more about this amazing bird let’s get to draw it. 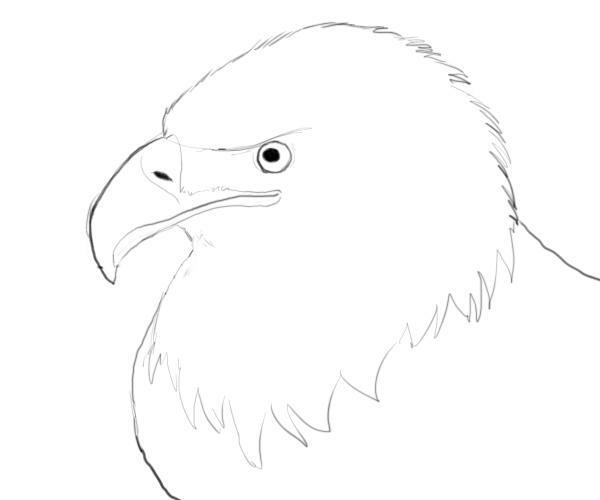 Bald Eagle Drawings – Let’s get started! The first thing to do is to establish the main lines and shape that will guide as through the drawing. 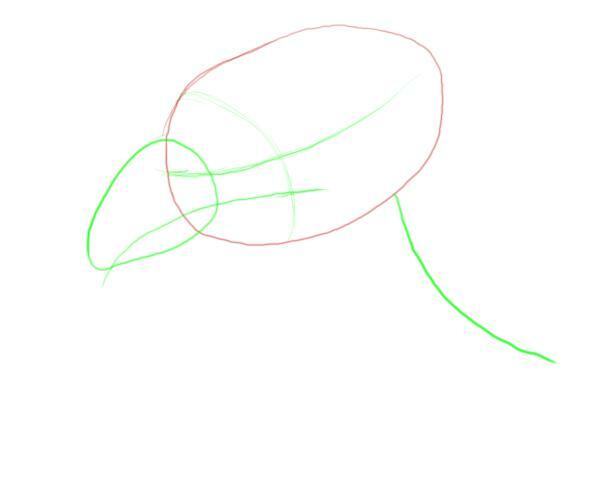 In this case I have drawn three simple shapes that will form the head (red), the beak and the neck of the eagle (green). Once these main shapes are established let’s get into them and try to define a line that will mar the position of the eyes and another line marking the mouth line. I have drawn both lines in green and I have tried to follow the volume of the shapes. So for example the eye-line is curved as it is supposed to follow the curvature of the head. Same thing for the beak. Ok now we have a pretty solid structure for our drawing. What I have done in this step is simply to wrap the seleton lines within an outline that give us a reference for where the actual body of the eagle is. I have also drawn a simple circle for the eye and marked in black the beak line. After removing the construction lines, you can do it now, we have now a solid outline of what our final drawing is going to look like and to be honest with you from this point on it’s a matter of patiently adding the necessary detail to make our drawing look good. You might have noticed that in the drawing below I have just added a thin eyebrow line and a small dot representing the nostril of the eagle. 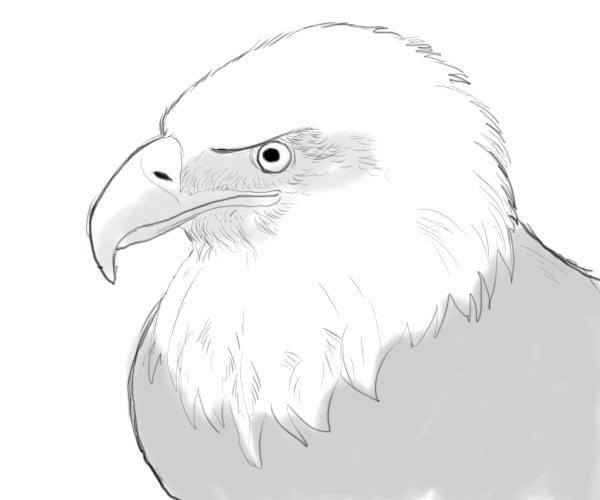 Also I have drawn very sketchy line representing the intersection between the white and black fethers of the eagle, just below the head. In this step as you see I am not adding any more fundamental shape to the drawing just working at the details. Using an image as a reference you can get the level of detail that you prefer. Here I am just adding a bit of fuzzyness to the outline to simulate the presence of fethers. Plus I have drawn a pupil and refined the beak. In this step our endeavor of adding details to the drawing continues. 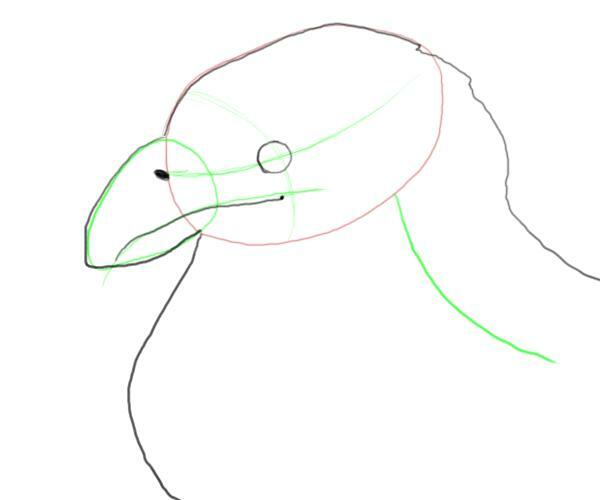 More fuzzyness to the outline, the beak is even more refined and I have added very small pencil strokes around the eye and at the base of the beak to simulate the presence of fethers. The first touch to finish our drawing would be to thicken the outline to give more contrast and character to it. Secondly we will add a light grey tone to create a shadow in some crucial areas. I have used digital coloring in this case. Imagine the light comes from the upper-right of the scene. Shadow will form under the eyebrow, beak and obviously on the front part of the body. To finish it I have added a strongest and darker tone to emphasise the shadow around the eye and on the body and quickly added some darker spot on the body. The final touch will be drawing with a white pencil on the grey area to again simulate the presence of feathers. This last step concludes ur new tutorial. I hope you enjoyed it. Leave comments and feedback, we wold love to hear from you.